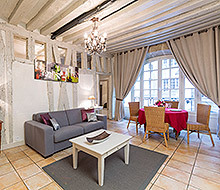 This charming two bedroom Paris rental comes with a balcony with outdoor seating and potted plants, parquet floors, and rooms designed with antiques and artwork. The living room is in high color, like a flushed cheek, in shades of rose and cinnamon, and has parquet floors, oriental rugs, tapestry armchairs, overstuffed sofas, and fine antiques. Its south-facing balcony, decorated with plants and furnished with a small table and chairs, is a quiet and private spot to take in the beauty of Paris rooftops. It gets especially quiet after 8:30pm and on Sundays when the street it overlooks is closed to non-resident pedestrian traffic. The dining room can accommodate up to six guests. 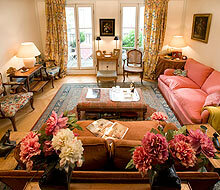 The room also has an antique wooden sideboard, curtained windows, an area rug, and scenes of Paris on the walls. Adjacent to the dining room is the fully equipped kitchen, with wood cabinets, white tile floors, and additional seating. The master bedroom has a queen-sized bed and offers a workspace, side chair, bookshelves, and large area rug. French doors open onto a small balcony. Outside the bedroom is a modern bathroom with a tiled floor and walls, bathtub, shower, washbasin, and WC. 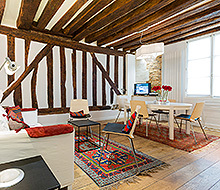 From the living room, a winding wooden staircase leads to the upper floor and the second bedroom, an annex for two. 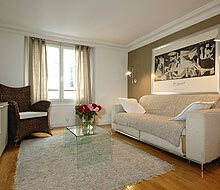 It has a desk and office chair and a king-sized bed that can be separated into two single beds. Note: the sleeping area is not closed. Next to this bedroom is a second bathroom with tiled floor and walls, a bathtub, and a washbasin. An additional WC is located off the living room.